Even in the darkest days of the Toronto Blue Jays 2017 season, there will still be Stuff to discuss. Let’s look and see how this tire fire has played out in the world of advanced pitching metrics. The Starters who have managed to stick around for more than spot starts or one inning blow outs (looking at you, Frankie) have had their ups and downs this season. Marco Estrada has an interesting relationship with the Stuff Metric – when he throws his Curveball, things look a lot better (due to an increased separation between pitches). 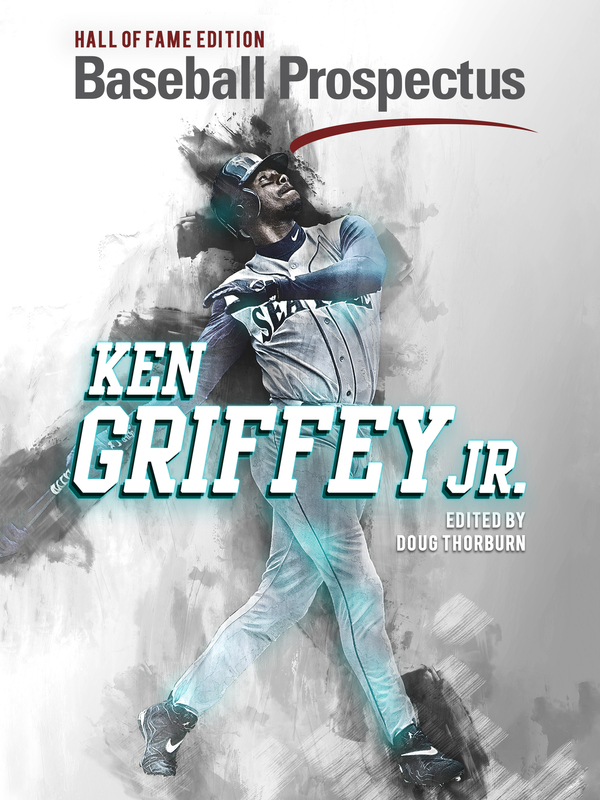 His Stuff is never going to be elite – not when his fastball sits nearly a full standard deviation below league average, but when he doesn’t throw the curve at all, his Stuff falls completely off a cliff. His season started out with a lot of variability, then hit a declining phase – but after the All Star break – the Stuff has looked a lot more consistent. Stroman has had some very consistent Stuff – a coefficient of variation on the season of 60%. While this is high with respect to his peers, he has the least amount of variability on the Blue Jays staff (amongst starters who have appeared in at least 15 weeks). 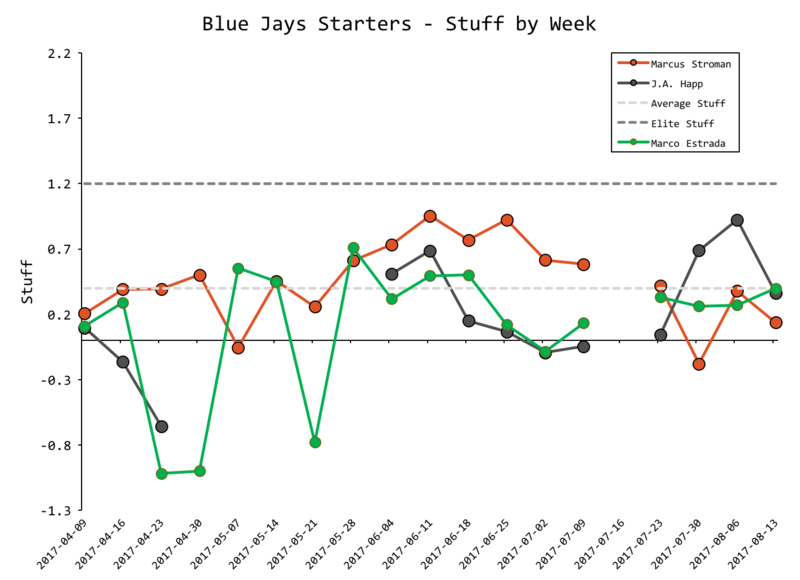 From an injury perspective, lower variability in Stuff on a weekly basis is linked to reduced injury chances which obviously is a point in Stroman’s favour. 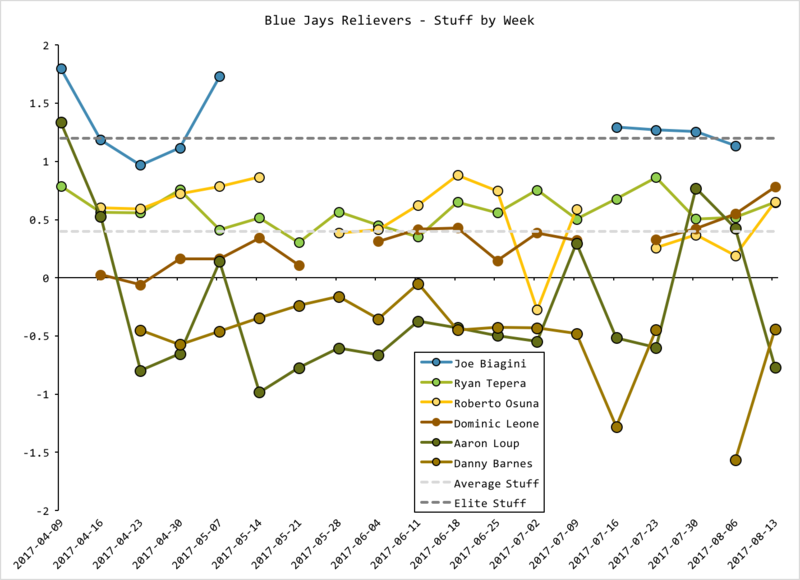 On the flip side, Happ and Estrada have some of the most variability in their Stuff in the entire MLB. Well now, this doesn’t look good at all. Last year, the Blue Jays had elite Stuff relievers in both Joe Biagini and Roberto Osuna. This year, Osuna has had an up and down year with his Stuff and has hovered right below league average Stuff (0.4). The Twitterverse started getting huffy with me this week when I tweeted that Roberto Osuna should be shut down for the year to prevent injury and ensure he will be a huge part of the team for seasons to come. Like I had mentioned, Osuna’s Stuff is way down – he has lost a significant amount off of his fastball and he seems to just refuse to throw the fourseamer anymore. Not only has his fastball dropped off, but Osunas has lost Stuff in all other areas too. There’s less separation between his pitches and less range of velocity between the pitch arsenal. 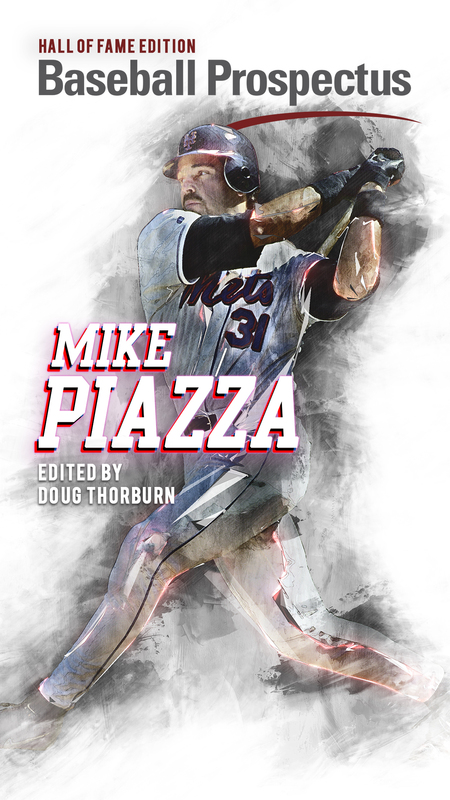 I wrote an article that examined workloads in pitchers that tried to come up with a metric that compared relievers to starters in the same light. 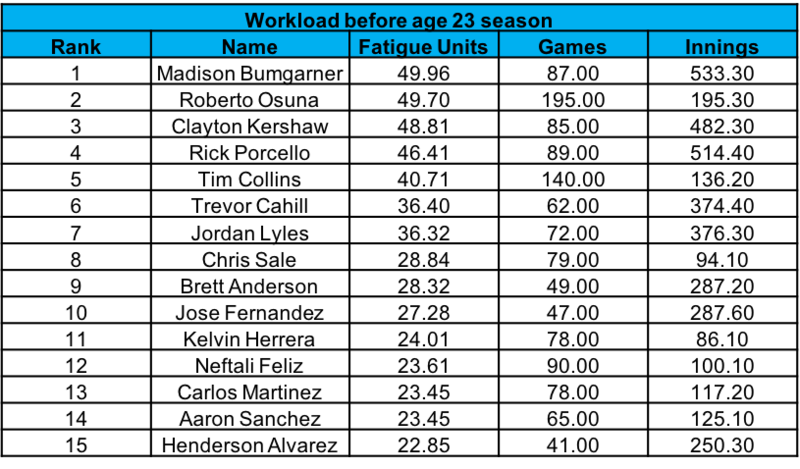 Looking closely at these values (in the PitchFX era), there has only been one pitcher that had a higher workload before they turned 23 – Madison Bumgarner. In addition, no pitcher had appeared in more games than Osuna. 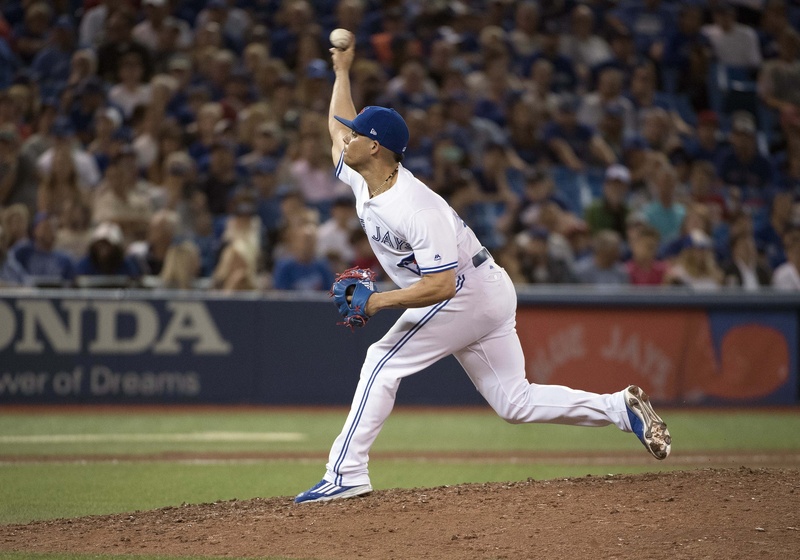 These are uncharted waters – and if the Jays are seeing these same signs, a tough decision is coming; is it worth risking the health of one of baseball’s best young closers for an outside shot at the second wildcard, in exchange for losing him for parts of the next two? Canadian Certified Professional Ergonomist, and Injury Prevention Researcher. I like baseball and science - the order depends on the day.